A degraded visual environment occurs when helicopters landing on loose soil, such as desert terrain, stir up dust that creates brownout conditions which make it challenging for pilots to see obstacles on the ground. The simulation will support the development of a multi-sensor system designed to give U.S. Army rotorcraft pilots better situational awareness during these challenging conditions. GTRI researchers are developing different ways to show fused sensor images to pilots during brownout conditions. 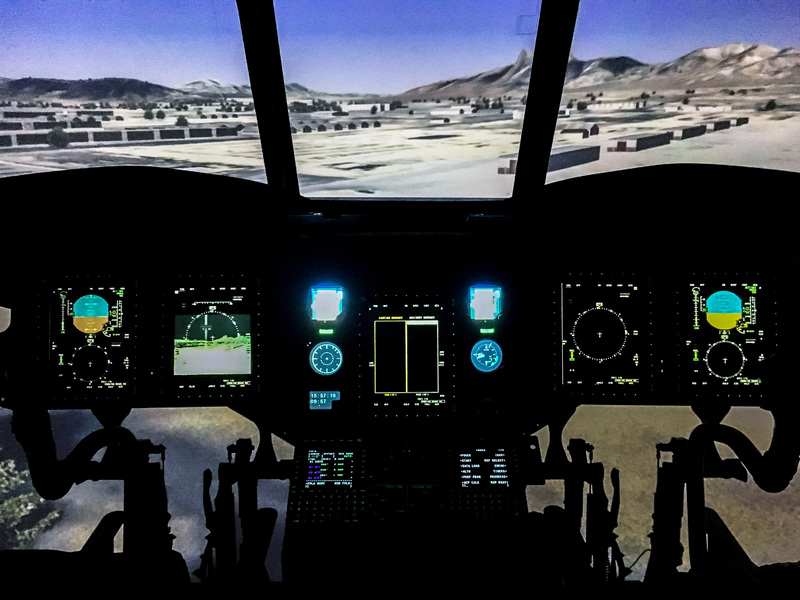 In an Army cockpit simulator lab, experienced rotorcraft pilots will use the simulations to determine how information should be presented during high-stress approach, landing and takeoff conditions. The pilot feedback will assist the Army in defining the Pilot Vehicle Interface for the new Degraded Visual Environment (DVE) system that will be used on Black Hawk and Chinook helicopters. It will also be used to inform a milestone decision for integration into the Army aviation platforms. “During Crew Station Working Group (CSWG) events, aviators are then monitored for their performance during simulated flight approach, landing, and takeoff and will be asked to evaluate the features of the system and provide feedback on symbology and information displayed,” Grigorian said. Their preferences will be evaluated and included in the system. GTRI researchers are working with the U.S. Army Aviation and Missile Research Development and Engineering Center’s (AMRDEC) System Simulation and Development Directorate (SSDD), and Program Executive Office (PEO) Aviation’s Aviation System. GTRI’s developed platform is incorporated into SSDD’s out-the-window system in the Battlefield Highly Immersive Virtual Environment (BHIVE), providing a real-time point cloud imagery of potential hazards, including configurable 3D conformal symbologies, emulating multi-sensor behavior based on terrain imagery received from the BHIVE’s image generator. The simulation project is challenging because the data comes from different sources, at different data rates and different resolutions. The emulator must work accurately under varying conditions, including daytime and nighttime operations. Because the system is used to analyze pilot interaction with the new sensors, the provided solution includes flexibility to easily reconfigure various parameters such as symbology sets, types of sensors, sensor performance characteristics, and symbology color. In collaboration with the U.S. Army, GTRI is providing the simulation system to the Army to conduct human factors evaluations. GTRI’s Human Factors Branch, which specializes in human-computer interface (HCI) issues for other Department of Defense needs, is also assisting with this development effort. The GTRI developed simulation system will continue to evolve to inform the Army on potential upgrades to meet new requirements and adapting to new technology for better performance. The simulation will be used to evaluate future DVE upgrades in a System Integration Lab (SIL) before they are implemented on the aircraft. The effort is a cross-laboratory collaboration among three GTRI laboratories: the Applied Systems Laboratory (ASL) in Huntsville, and the Electro-Optical Systems Laboratory (EOSL), and Electronic Systems Laboratory (ELSYS) in Atlanta. In addition to Grigorian, the simulator project also involves John Stewart, Oliver Pierson, Priyank Patel, Albert Sheffer, and Chris Cordell of EOSL, and Jeff O’Hara of ELSYS. FalconView 3-D adds capabilities to better support surface missions carried out by ground units, ships, and others.